Do any of these symptoms sound familiar to you? If so, we strongly encourage you to contact Covina Family Dental today and schedule a checkup. You may be a victim of bruxism, which is more commonly referred to as teeth grinding. Studies have shown that 70% of people regularly grind and clench teeth because of stress and anxiety. Many don’t even realize it because they only experience it while asleep and unaware. 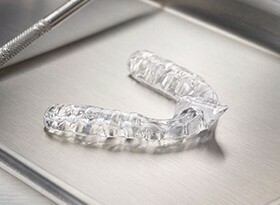 In order to protect your smile from potentially serious harm, consider investing in a nightguard. Dr. Tran can design a custom-made oral appliance that perfectly fits your unique mouth and is durable enough to protect the rows of teeth during grinding episodes.